Sometimes, for various reasons, a vanity or tub that normally gets installed butting up next to the side walls is floated away from the wall. When you are trying to create a light and airy feeling, pulling something just a few inches away from the wall will provide some much needed breathing room and make a huge difference in where the space ends visually. It can make the item -- such as a vanity or a tub -- appear as an object in the space when it's placed upon the floor with volume around itself and, most importantly, the floor. Having a floor extend beyond is a great way to visually enlarge a space. That’s one reason why we do pedestal sinks and free-standing tubs in bathrooms. It gives that item special attention. It gives it some prominence, a silhouette. It becomes an object instead of blending in with the wall and the surfaces all around, instead of blending in to the planes of the space. Do you see how you don't notice the tub at all in the image at the very top of this post? That's as it should be. You want to focus on the view there. However, sometimes within a room, you want some of the items to stand out and be featured. Objects featured within a space are more noticeable, more sculptural. I recently had a client that I tried and tried to sell this idea to. We had a spectacular, feature mosaic wall behind the tub that was attached on one side to the side-wall of the space. 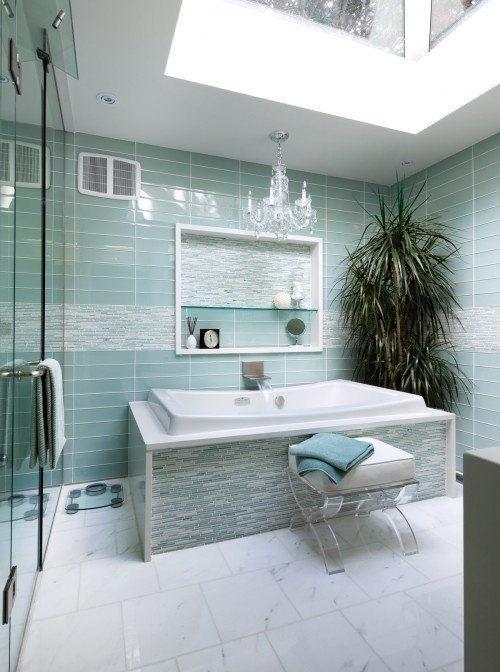 I wanted the tub to float in front of that wall to lend a more symmetrical look to the room to give that expensive mosaic tile wall the special attention it deserved. We couldn't use a free-standing tub in this instance because the client required a built-in. By centering that built-in tub on the mosaic wall it would have appeared to float, the wall would have become more of a feature, and the whole space would have felt more symmetrical. But now... it's merely going to meld into the walls and just be part of the finishes of the room. Yes, I caved. And I hate caving. Oh well, on to the next one. "Doing a tub surround floating in the space, away from the side wall(s) does, in fact, create that free-standing tub look. Oh, and it makes that built-in tub all the more special."